"A deep accounting of how America got to a point where a median white family has 13 times more wealth than the median black family." "Extraordinary... Baradaran focuses on a part of the American story that's often ignored: the way African Americans were locked out of the financial engines that create wealth in America." When the Emancipation Proclamation was signed in 1863, the black community owned less than 1 percent of the total wealth in America. More than 150 years later, that number has barely budged. 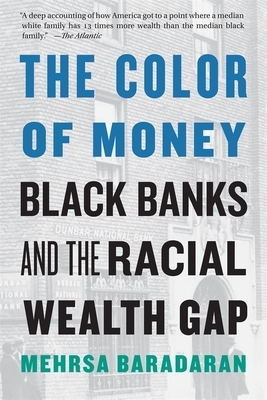 The Color of Money seeks to explain the stubborn persistence of this racial wealth gap by focusing on the generators of wealth in the black community: black banks. With the civil rights movement in full swing, President Nixon promoted "black capitalism," a plan to support black banks and minority-owned businesses. But the catch-22 of black banking is that the very institutions needed to help communities escape the deep poverty caused by discrimination and segregation inevitably became victims of that same poverty. In this timely and eye-opening account, Baradaran challenges the long-standing belief that black communities could ever really hope to accumulate wealth in a segregated economy. "Black capitalism has not improved the economic lives of black people, and Baradaran deftly explains the reasons why." "A must read for anyone interested in closing America's racial wealth gap."